Order any FIVE (5) packets of our homemade fried salmon skin and get ONE (1) for free !! 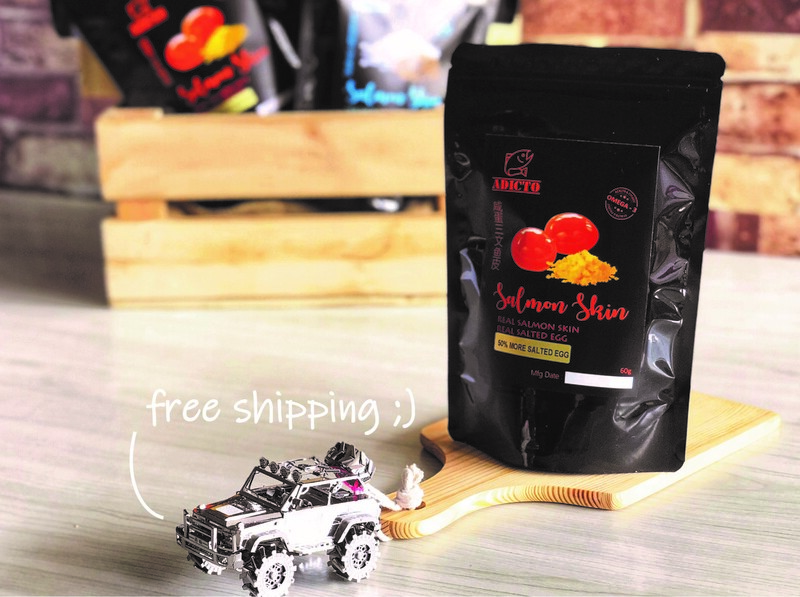 Besides, with our on going RM100 FREE SHIPPING promo, you had saved a RM30!! Step 2 : Check out with discount code "BUY5FREE1"
Step 3 : Sit back and wait for your crispy salmon skin to arrive! 1. You need to add total of SIX (6) packets (72 grams) of ADIICTO Salmon Skin into cart, and checkout using discount code "BUY5FREE1" to enjoy the promotion package. 2. The discount code "BUY5FREE1" applied will deduct an amount of RM20 for your entire order. 3. The BUY5FREE1 promotion package comes with FREE shipping within to anywhere in Peninsular Malaysia and Singapore. Standard shipping charges will be applied for other areas. 4. For order of more than 1 set of BUY5FREE1 promotion package, please place your orders separately into different orders. Alternatively, you may place your order via Messenger to save the hassles. 5. Only 1 discount code can be used for every single order. This promotion is not applicable with any other discounts. 6. Free shipping promotion within Peninsular Malaysia is available for all orders of RM100 and above. 8. This promotion is only available for Standard Shipping within Peninsular Malaysia. Other specific courier service is not valid for this promotion. 9. Our default carrier for Standard Shipping is Ninja Logistics Sdn. Bhd. (Ninja Van). 10. Shipping fee is calculated after any discount code applied (if applicable). 11. The company reserves the rights to amend the terms and conditions without any prior notice.